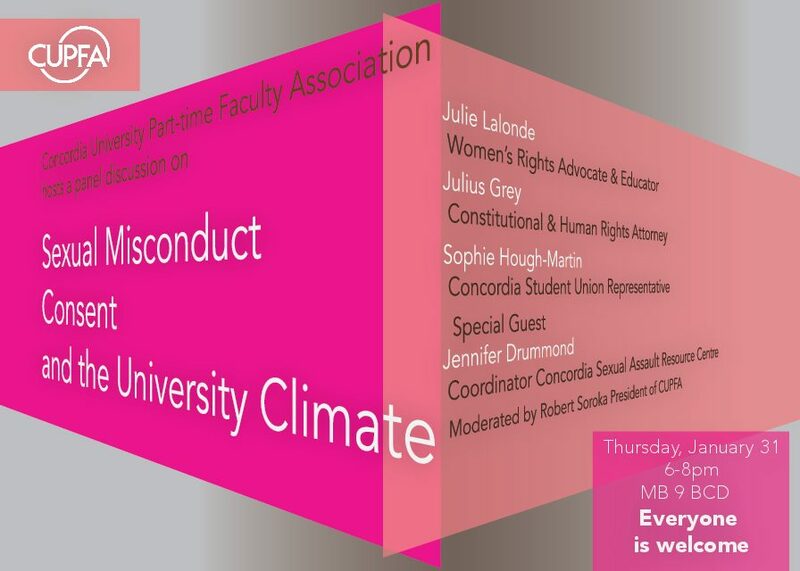 In order to provide a platform to discuss a very serious university issue, CUPFA is hosting a panel discussion on Sexual Misconduct, Consent, and the University Climate. Panelists, including women’s rights advocate and educator Julie Lalonde, constitutional and human rights attorney Julius Grey, and Concordia’s Student Union representative Sophie Hough-Martin, will respond to questions posed by the moderator, CUPFA President Robert Soroka, related to relationships between members of a university community, the impact of such relationships, boundaries, and the potential for conflict of interest that are germane to professors, students, and staff. After the discussion, special guest Jennifer Drummond, Coordinator of the Concordia Sexual Assault Resource Centre, will be on hand to answer questions. Date/Time: Thursday, January 31, 2019, 6:00 p.m. – 7:45 p.m.